Swim The Fly was definitely not what I expected. I read it after seeing a fabulous review on Steph Su Reads' site. The basic plot point revolves around three boys' summertime goal to see a live naked girl. The title comes from Matt, the main character's, personal goal to swim the 100-m butterfly at the swim team championships. This ambition is cheapened somewhat by the fact that he only did it to impress his crush, Kelly. 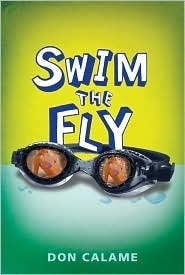 I assumed that Swim The Fly would be crude and gross. And parts of it were. But it was uniformly hilarious. I laughed until tears came out of my eyes over numerous chapters. I kept having to stop and re-read the book to my husband. I even called my parents and read portions of the book to them. I particularly loved Grandpa's gift of the kitten to Mrs. H; Matt's introduction to Ulf (the sadistic swim instructor); the Clamato classic; and the protein powder/laxative incident in the locker room. I was also surprised by the underlying lessons and sweetness behind the hilarity. Matt and his friends are geeky, immature, hormone-crazed boys, but they are also loyal friends. Matt is a good son, grandson, and brother. I like how he says that he hates his brother until he does something that just makes him remember how much he loves him. It seems so realistic. Matt gets to know his crush, Kelly, and her friend, Valerie, throughout the summer. He learns what really is important in a girlfriend. He also learns the value of hard-work and just why swimming the fly is something beyond impressing a girl. I loved the ending of the book, so much so that I even teared up a bit (but then again, I cry at commercials for dog food). By the end of the summer, Matt is beginning to become a man. While I wouldn't want to date a 15-year-old Matt, I think the man he'll become in a few years will be someone really special. This is a great read for reluctant readers, especially boys. Matt, Sean, and Cooper's hijinks will keep anyone interested. Even better, the book is much like a series of short stories. There are very distinct scenes (perhaps because the author is a screenwriter). It is easy for someone to pick this up and read a chapter at a time and not feel lost. I'm glad you enjoyed it as much as I did, and picked up because of my review! Once you appear in therefore you will America of America day cash enhancements to urge all of our Salaryday and to boot Fitting Mortgage, to boot to presumably will your initial compensation maybe become captivation entirely free, you will get to satisfy up with all auto title loans of our personnel, discover all of our services and spot the event related to specifically but borrowing kind America of America day cash enhancements will assist you pattern your short term economical wants.